I set off from home around 7am – taxi to Derby Train Station and the 0730 to Birmingham. Pete met me on the train at Burton. Arriving at New Street we hopped onto the airport-bound train, where we bumped into Caburn, also flying to Inverness to start his 2017 TGO. The airline flew Pete and I plus one pack to Inverness… yes, one pack short! After a frustrating visit to the customer services desk and some “computer says no” responses, Flybe agreed to fly Pete’s pack (if found) up to Inverness the next day and courier it to us. This put a serious spanner in the works and all excitement for the TGO start was now on hold. So rather deflated, we set off for Plockton. We checked into the B&B at Plockton and made a series of airline/airport phone calls in a bid for news about the missing pack. 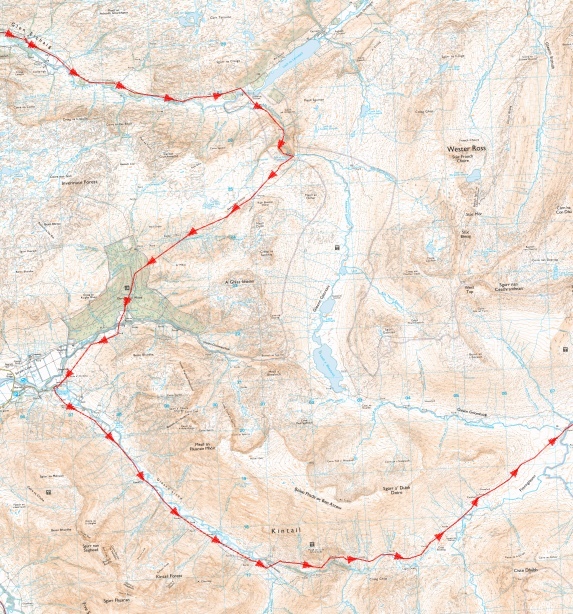 Pete decided to travel to Inverness Airport the next day to meet his pack off the flight and then return to Shiel Bridge to start his TGO – we’d worked out he could beat the courier and that way salvage his TGO. I agreed to abandon my brother and start as planned from Plockton. Waving the little brother goodbye as he made his way back to the airport, I signed out of the Plockton Hotel at 9am. I’d planned to take a route out of the village via the aerial mast because it seemed the easiest way. However, I met a few other Challengers at the hotel: Rosie, Dickie and Robin. They’d opted to take the road for a short while and join the path I’d be picking up further East, so I decided to join them. We had a little trouble trying to pass through a pine forest that had been partially felled, but eventually found a path around it. This was about the time I found my first tick! Only a small one climbing over my hand, who was promptly squashed. Dickie has one of those MSR water filter pumps, which he kindly refilled our water bottles with. Despite the filtering the water stunk of sulphur and we named it “trump water”. I’m sure you could eventually get used to that, but I decided to give it a miss. We later heard from challenge control that a few people became ill from drinking dodgy water early on in the challenge, so I’m glad we didn’t indulge. Rosie and Dickie stopped at Loch nah Onaich; Robin and I continued on to Killilan to camp, where we met Bill and James. After using the phone box at Killilan and speaking to Pete, now at Inverness Airport, it transpired that his pack didn’t arrive! That’s twice now the airline/airport had messed this simple task up! He’d arranged for the pack to be flown to Aberdeen that evening where it would be couriered to Shiel Bridge early the next day. He’d stay the night in Inverness and then take the train yet again back to the West coast. 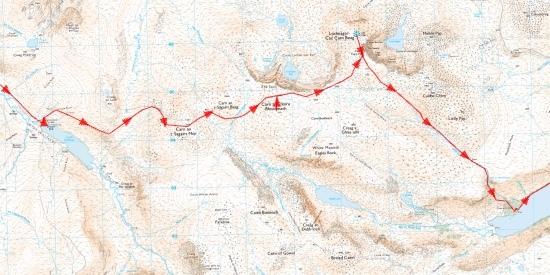 All going well, Pete and his pack would arrive at Shiel Bridge about the same time and he could sign out of the Kintail Lodge Hotel to ensure a legitimate TGO crossing. I got up fairly early and set off alone for The Falls of Glomach, from where I would make my way WEST to Shiel Bridge. I managed to get phone signal along the way and the great news came that Pete had finally got his pack thanks to the super human efforts of the courier (Inverness > Aberdeen> Shiel Bridge > Inverness). I met Pete (plus pack!) in Morvich later than anticipated around midday, so we took our foul weather alternative (FWA) route, following the River Core to Camban Bothy. Originally we’d planned to summit the 5 Sisters of Kintail but it was late in the day. This, coupled with the stress of the missing pack meant we decided to take it easy. Arriving at Camban Bothy we met two other Challengers, Tristan and Andy. A while later four lads arrived on mountain bikes, who stayed for the night and were headed to Morvich the next day, where we had just come from. That evening we heard mice scurrying around looking for food but luckily we’d hung everything up out of their reach, although Pete did catch one trying to join him in his sleeping bag! We read through the bothy book that morning and one particular (well-illustrated) entry was signed at the end “God speed you crazy bastards!” This became the phrase of our challenge. A sunny start to the day but with heavy showers forecast and a knee complaint (early teething problem), we opted to again stick low. 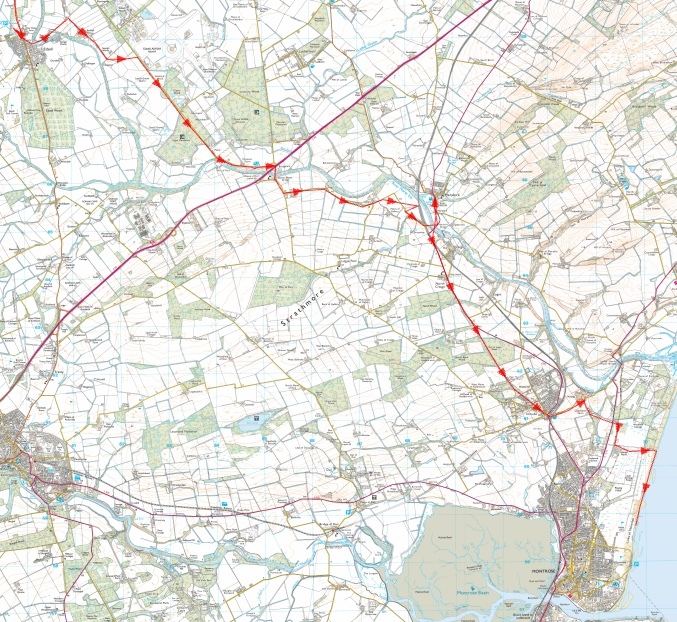 Unfortunately today’s FWA had been the one we never wanted to use, because it meant 15km of ‘A’ road! Still, taking the FWA seemed like the safer option to allow some recovery, getting accustomed to the long days. Leaving the bothy we crossed a few burns and headed South along An Caorann Mor to Loch Cluanie, which the A87 runs alongside. Not the nicest of roads to walk, it was pathless and very busy. By coincidence we met a local police officer a few days later who said he see saw us and had nearly stopped to ask us to re-route. Apparently the stretch of road is notorious with accidents claiming over 6 lives a year. Eventually we arrived at the Ceannacroc Estate and found a nice spot to camp for the night. Space between tree roots was limited so we engineered a way to pitch the Trailstars close together, which worked great. A typical evening of pasta, soup and whisky followed. Heading back to the A87 for the final time we crossed over into an entrance to a wind farm. A short walk up one of the service roads we were met by a maintenance vehicle. The driver asked where we were going and his response was “why’re you going up there, there’s f***’ll up there!”. He even offered us a lift to Fort Augustus which we politely declined. It turned out that the service roads for the existing wind farm had been altered for a new set of turbines currently being constructed, so heather bashing began! We picked up a track for a few kilometres before crossing 4km of open moor to meet the Old Military Road to Fort Augustus. We met Amanda and Jean-Marc (widely known as ‘The Canadians’) on the way down to Fort Augustus and spent a couple of hours walking with them. Arriving in the early evening we headed to the Loch Inn for some much needed rehydration. This is where we met Tim and Faz for the first time – top blokes, very glad we had the pleasure of meeting them. A couple of pints later we met Amanda and JM at the chip shop and sat out in the rain in our rain kilts! We checked in at the Campsite and stuck some washing on. We bumped into Dickie and Rosie again, who were glad to learn that Pete was now with-rucksack, and we headed back to the pub. There we met Andrew Walker, JJ and a few others. It was a fairly relaxed start to the day after the late night in the pub and spilling whisky in Pete’s Trailstar (which he skilfully hoovered up off the groundsheet). Most of the other challengers (approx 15 tents) had already scarpered, with just a few still packing away. Today we were to head over the Monadhliath to Cairn Ewen via the new Reservoir. Word reached us of a cocktail party at the remote Chalybeate Springs, which was on our route and just slightly short of where we planned to camp. It’s a good thing we did stop short really because the day was a long slog following the new wind farm service tracks for ~25km. JCBs in their plenty rushed by along the dusty track hour after hour, so not a pleasant walk. We were also pursued by a slow-moving roller-compactor for a while, but we seemed to get the better of it! Things improved vastly when we arrived at Chalybeate – dozens of challengers (Peter, Jayme, Mario, JJ, Martin, Keith, Andrew, Tim, Faz, Lindsey, Paula, Rob and Rebecca, Carl, Andy… the list goes on) were already there so we picked a spot amongst the tents and joined in the cocktail party (cheese, pate and whisky). It was a cold night so by around midnight most people had turned in. The second day of the Monadhliath, but this time over snow, moor and munro. Can Dearg to be exact, our first munro, which at 945m is not the highest but a munro it is. Dropping down into Glenn Lochain we followed the glen to Glen Banchor and on to Newtonmore, where we had a pitstop (pint with Tim and Carl). Then the final road walk to Kingussie where we checked into The Tipsy Laird. £20 per head for a shared room with two bunkbeds including breakfast – quite a bargain I think. They also have a washing machine and drying room (though the latter stinks of diesel!). We met Rob here who was on his tenth crossing! Fish and chips for dinner followed by a few pints. Our maps were sprawled across the table, having a few route decisions to make at this point. Entirely undecided we had a few more beers and went to bed. Rob left early for Aviemore while Pete and I packed our kit. 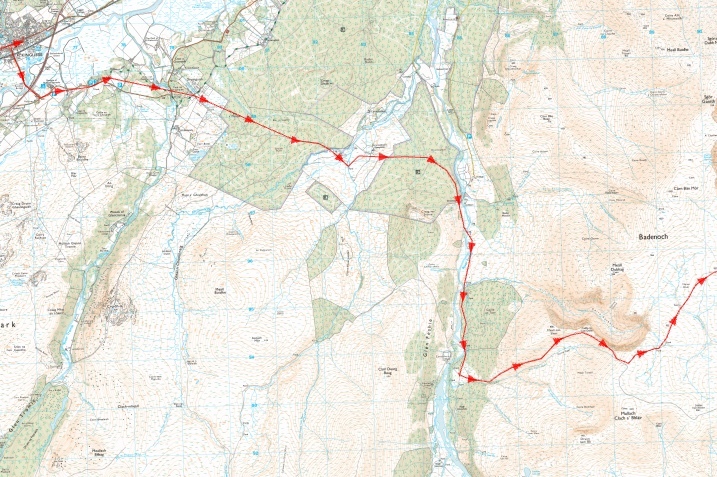 We’d narrowed the route down to two options: a) follow the River Feshie around to Linn of Dee, or b) cross the Cairngorm Plateau. Heading out of Kingussie we met a few familiar faces such as Andy, Faz, Tim, JJ, and some people new to us, like Barry and Colin. A short road walk led us to the tracks over to the Feshie. This is a really picturesque area! We followed the Feshie South and stopped just before Ruigh Aiteachin bothy (not 100% sure of the name). This was the decision point in our route – whether to continue South and camp near the bothy (the more popular route among TGO-ers) or head East up onto the plateau. The sensible option was the low road, and we deliberated for over an hour, but having already missed out on some high points earlier in our route, we headed East. It’s a longish climb, approx +650m over 3-4km, and upon reaching the top we found a perfect spot. It was in a slight dip next to a burn and there wasn’t a breath of wind. A clear night, a great sunset and a dramatic view of The Angel’s Peak and Cairn Toul (tomorrow’s tasks) on the horizon. The temperature didn’t drop below 3c and the wind stayed off all night, perfect. Usual routine… pasta, soup, whisky. As we were packing kit away an early-rising challenger (didn’t catch his name) passed us. He’d camped by the bothy and walked up the way we had come. Soon afterwards we met Sabine, who had done the same thing. She was heading over to Tom Dubh. We set off for Angel’s Peak – navigating the moor and various bogs we made good time and summited munro #2, this time a better altitude of 1268m. Following the ridge East to munro #3 Cairn Toul (1291m) and then on to Stop Coire and finally Devil’s Point, munro #4 (1004m). We dropped down to Corrour Bothy, where we passed Tim and Carl heading up to bag Devils Point. We stopped for a breather at the bothy before following the Lairig Ghru South and on to Derry Lodge. Again we met Peter, Mario, Jayme, Tim, Faz, Lindsey, Paula, Carl, Rob and Rebecca, plus a few others whose names I didn’t get. There is a mountain rescue post at Derry Lodge along with a toilet/bucket – avoid this. The usual evening routine commenced. Leaving Derry Lodge we followed Glen Lui South to Mar Lodge for a brew and a biscuit where we met a load of other challengers. We met Dickie and Rosie again who had tales of a mishap at Cougie Lodge, but I’ll leave that for them to tell. After a short break we set off for Braemar, which we’d been advised to take the road to. Apparently there are still challengers wandering lost in the woods near Braemar since 1996. We checked into the Braemar campsite, where Mick (Croydon) was on hand to help us settle in, we pitched the trail stars and put a wash on. A quick shower and we walked to the fish and chip shop for some much needed sustenance. The night continued at the Invercauld Arms where many challengers met for a night of singing, poems and merriment. This is really just the warm up for Lochcallater lodge. It also seems I didn’t use my camera today. A lazy morning and we left Braemar around midday after a very nice Scampi and Chips in Gordon’s Tearooms and a resupply of food and whisky. We followed the golf course road out of Braemar, and taking the Callater Burn South we passed dozens of day walkers coming the other way. Arriving at Lochcallater lodge by late afternoon many challengers had already setup their tents on the grass next to the building. Squeezing inside we were suddenly amongst a great company of challengers. In fact, almost everyone we’d met to date, and for the first time Paddy, Gill, Dennis, Alan, Stevie, Aaron, Laurence and several others. We were fortunate enough to find a bunk in the bothy so we dropped our kit and went in the house for a beer! Bill who looks after the lodge opens it specially for the TGO each year and puts on food and drink for everyone that passes through. A great night of singing (Mick doing his Dustman song, Faz playing his whistle, JJ with some poetry, Pete did a Leonard Cohen rendition, Carl and Tim played guitar and sang a few songs). Bill made a toast and handed around the friendship cup which was full of Laphroaig. Everyone had to take a sip, make a short speech (some longer than others… Gill) and pass the cup on – this turned into a good laugh! “For f**** sake Tim don’t finish it!”. The singing went on into the night. Another slow start… not surprising really! Bill and co were busy making parting gifts of bacon butties and coffee and offering the same to passing challengers. We eventually gathered the enthusiasm to head out into the wind and rain and make our way over to Lochnagar. 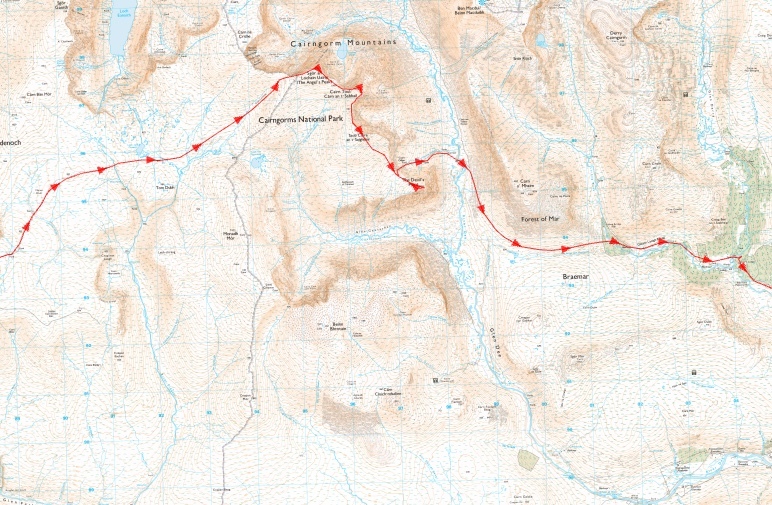 The route climbs steeply out of Lochcallater over to Carn an t-Sagairt Mor and East to Carn a’ Choire Bhoidheach, both of which are munros (1047m and 1110m). North to Lochnager (munro #7) before turning South via The Falls of the Glas Allt down to Loch Muick, where we stopped at Glas allt-Shiel for the night. There we joined Tim, Carl, Faz, Paula, Lindsey, Rob, Rebecca and for the first time Ian. The bothy is part of a larger building built by Queen Victoria in 1868. The bothy consists of two floors, the ground floor has a fire, table, chairs and plenty of drying space. The first floor is boarded out for sleeping. Early evening another challenger arrived and camped outside on the grass because he wanted to get as much camping in as possible and the views were amazing. I suspect it was more the smelly crowded bothy that swung his decision. Tim, Pete, Ian and I slept on the floor on the ground floor and the rest upstairs. An early night for most, recoverying from Lochcallater. Tim, Pete, Ian and I stayed up a little later by the fire with a dram or two. Leaving Glas allt-Shiel we walked along the track by Loch Muick and over to the Spittal of Glenmuick, where we had a coffee at the visitors centre. Heading South we followed a burn and a bearing to Shielin of Mark (bothy) for lunch. After lunch was more heather-bashing up to Muckle Carn and down the other side to Glen Lee. Walking along Loch Lee we stopped at the Eastern end by a bench for a rest. Sitting there we noticed a dead mouse part-squashed on the floor by the bench. Later we would learn that this mouse had travelled by JJ’s boot for at least that day. The story goes the mouse must have climbed in the night before, JJ put them on in the morning along with said mouse. It wasn’t until he stopped at the bench by Loch Lee and removed his boots that he made the discovery. By this time the mouse had sadly passed away (there was nothing we could do with our meagre first aid kits). Apparently surprisingly comfortable, so boot manufacturers take note! Continuing East past Hill of Rowan we arrived at Tarfside. We joined the other 40+ tents on the playing field and headed over to the bar for a pint and a burger. The bar which is not normally open to the public opens each year for the TGO. This year they’d put on a BBQ. By 10pm challengers had drank all the beer and started on the wine, by 11pm the wine was finished and we made a start on the whisky. Another great night had by all! 10am-ish start and off to The Retreat for breakfast 2km down the road from Tarfside. Then most of the day we followed the River North Esk with Tim, Faz, Carl, Paula, Lindsey, Andy, Rob and Rebecca to Edzell. The intention was to continue along to North Water Bridge, but the beer was too good to pass at the Panmure Arms Hotel. A vote was taken and it was therefore decided that we’d stay put and look for somewhere to camp later that evening. A few of the group managed to get rooms at the hotel but Faz, Tim, Lindsey, Andy, Pete and I left the pub after dark and “stealth bivvied” on the local park with a bottle of Prosecco (to blend in with the local youths). We got up early and packed away as to not arouse any suspicion. We grabbed a couple of sausage rolls from the butchers, left Edzell passing the airfield to North Water Bridge and made a slight detour to Marykirk (they have a pub). A portion of chips and a couple of pints later we continued on in the 30c heat to the coast. Passing through Charleton Farm we climbed the sand dunes over to Kinnabar Links. Toes dipped and a few photos we walked along the beach to Montrose. Arriving at the Park Hotel to sign out at 5pm we had a quick pint before tracking down our B&B for the night. One last hurdle was to get in touch with the B&B landlord who didn’t seem to want to answer their phone or the door! 7pm we managed to check in, get a quick shower and run back to the Park Hotel for the dinner. We’d missed the soup but made it for the main course. Pretty much everyone we met warned us of the “rubber chicken” at the hotel but we decided to have the meal as it was our first challenge. It was great meeting everyone again, some we’d not seen for two weeks, some we’d met a few times along the way and some we’d spent days walking with. We stayed for the speeches and awards for 10th, 20th crossing etc before heading into Montrose for a pint with Tim, Faz, Andy, Paula, Lindsey and Rob. Leaving the B&B early Pete and I headed to Montrose Train station to begin our day of travel back to Derby. Arriving at Aberdeen by 9am we took the bus to the airport and boarded our flight to Birmingham. A shuttle and a train to Birmingham New Street then we caught the train for our final leg to Derby, where my wife and kids met us to take me home. Finally walking in the door by 5pm. 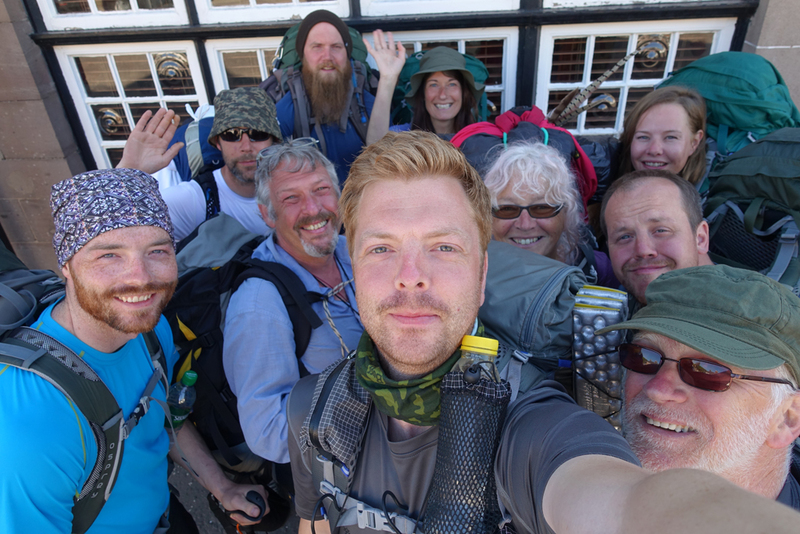 The TGO Challenge was a truly amazing experience and I thoroughly enjoyed every minute of it. It certainly is a challenge, no doubt about that! The wild, the scenery and the variety of brilliant people I met along the way made it an experience I’ll remember forever! I’ll definitely be back in a few year’s time. 327km, 8000m ascent, 7 munros, 13nights, 6 wild camps, 3 bothies, 3 campsites and 1 hostel. Thanks to everyone who donated – we managed to raise £1500 (including gift aid) for the British Red Cross. God speed you crazy bastards! Great blog Ritch and brought back some fantastic memories, was good to finish the crossing with you guys! Hope the return to normality wasn’t too traumatic, I’m still pining for the outdoors! Thanks Rebecca, yes it was great meeting you guys and tagging along with you. I think it’ll be a while until I’m fully adjusted back to the indoors (if ever!). Thanks Paula, I’m jealous you’re doing it all over again next year! It’ll be a few years before I get a pass out but hopefully 2019/2020 for me. 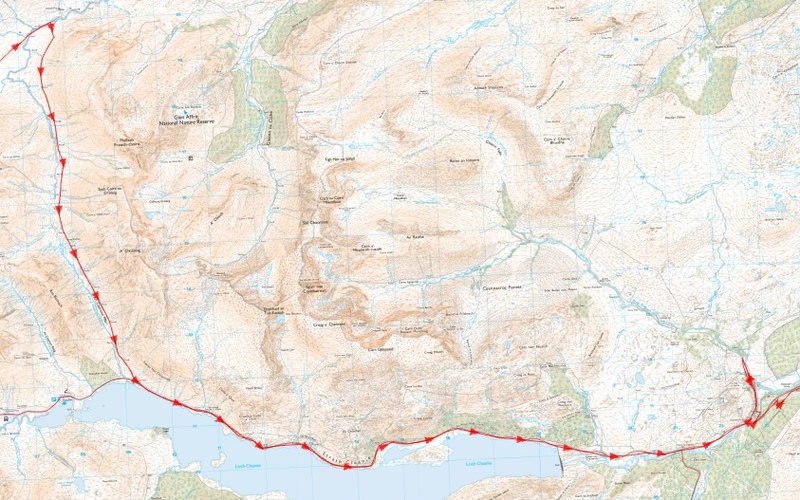 I’m planning on doing the Skye Trail next year in May (much shorter trip). It was great to meet you and the others, I’ll remember it forever. Good luck with next year!